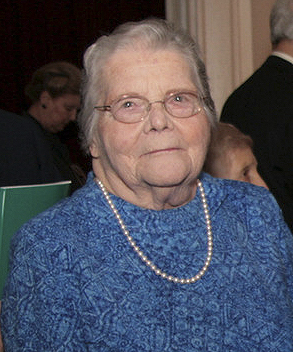 Rene Leilani Kuhn Bryant, a valued and longtime member of the ATBL’s Advisory Council, and wife of the late Douglas Wallace Bryant, the first Executive Director of the ATBL, died on January 30, 2013. She was 89. Rene was a graduate of the University of Michigan and an award winning writer and editor, who worked at Life Magazine, the United States Embassy in London, and the Radcliffe Institute. Rene was very instrumental in her husband’s writing and work, an active participant in many of the ATBL visits, and a close friend of Viscount Eccles and his wife Mary. There is a distinguished lecture series named for Douglas W. Bryant given each year at the British Library under the auspices of the Eccles Centre for American Studies. There was a memorial service for Rene on Sunday, March 17, 2013 at Harvard Memorial Church, with a reception afterwards at the Harvard Faculty Club. William Stoneman, ATBL’s Advisory Council member, and Librarian of the Houghton Library, represented the American Trust at the Memorial Service.